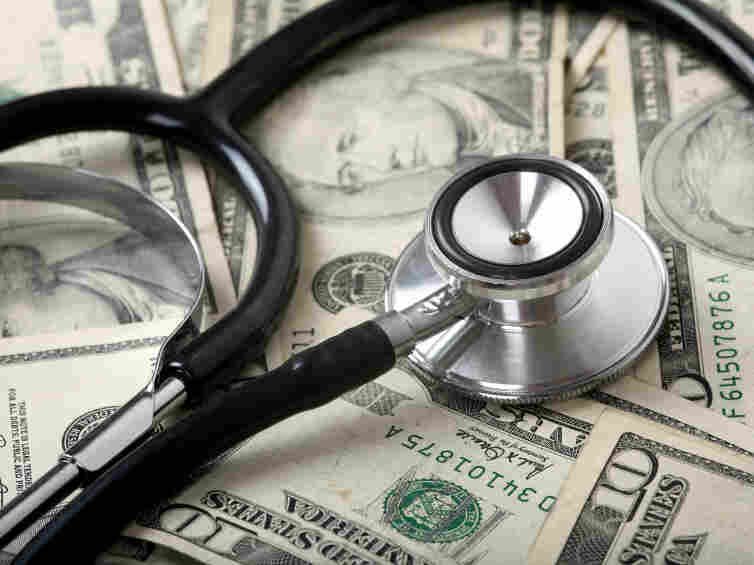 How The Affordable Care Act Pays For Insurance Subsidies : Shots - Health News The health care law is helping low- and middle-income Americans pay for their insurance. Where does that money come from? In part, it is a matter of the well-off helping pay for those who have less. But that's not the full answer. Johanna Humbert of Galien, Mich., was pleasantly surprised to discover that she qualifies for an insurance subsidy, since her current plan is being canceled. Humbert makes about $30,000 a year, so she'll get a subsidy of about $300 a month. The new plan is similar to her current one, but it will cost $250 — about half of what she pays now. On his show last Friday, liberal comedian Bill Maher called the Affordable Care Act a "Robin Hood" plan. "It does take from the rich to make better the poor," he said. You can certainly make a case for that, says economist Joseph Antos of the American Enterprise Institute. "In a general sense, the rich, of course, subsidize the poor. The rich pay more income taxes," he says. "So, yes, absolutely, that's how subsidies are supposed to work." So if you're a low-income person getting a tax credit from the U.S. Treasury to subsidize your health care, a big chunk of that credit is coming from taxes paid by the well-off. But the authors of the Affordable Care Act didn't want the subsidies to become a drain on the Treasury and add to the deficits. So they included provisions designed to offset the cost of the subsidies. "The other source of revenue is a tax increase on the wealthiest Americans," he says. "Those families with incomes above $250,000 a year will now have to pay more in Medicare payroll taxes." Those provisions actually make the bill a net positive for the federal budget, according to the nonpartisan Congressional Budget Office. By the CBO's accounting, Obamacare will produce a surplus. Gruber says the law will "actually lower the deficit by about $100 billion over the next decade and by $1 trillion in the decade after." Dentist Aaron McLemore of Louisville, Ky., makes more than $100,000 a year and doesn't qualify for any subsidy on the Obamacare exchange. The 31-year-old's current policy is being canceled. A new policy from the exchange will more than double his monthly premium and nearly double his yearly out-of-pocket maximum. His higher costs aren't subsidizing lower-income policyholders, whose subsidy has already been paid by the government. But he is providing a subsidy in another way: The Affordable Care Act requires him to buy a policy with features he doesn't need. "Seeing as I'm a single male with no kids or dependents, and I'm paying for pediatric dental care and maternity care, it doesn't make a whole lot of sense to me," McLemore says. It's not exactly the same. The Affordable Care Act allows insurers to charge older people up to three times more than younger people for policies. Still, Gruber, the MIT economist, says the model reflects the basic idea of insurance. "The notion of insurance is we're protected against risk," he says. "What that means is that [during] a period of time when we're healthy, we pay more in premiums than we collect in benefits. In those periods of time we're sick — and we all go through them — we collect more in benefits than we pay in premiums." The audio of this story, as did a previous Web version, says that dentist Aaron McLemore's new policy would boost his annual deductible to $7,000. In fact, the policy would nearly double his total out-of-pocket maximum liability for the year, but it would be less than $7,000.